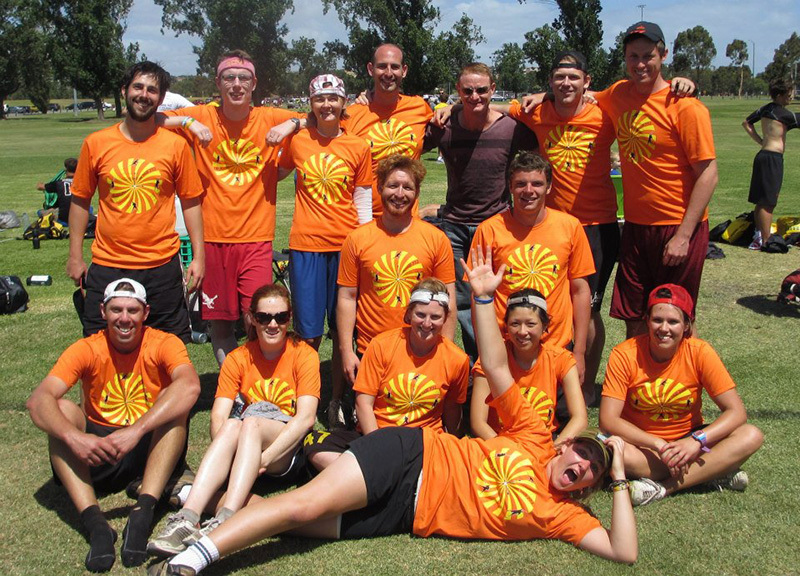 The Melbourne Hat is the longest running tournament in Australia. It began in 1989 and has continued to be a tournament that attracts players from all over Australia. It’s the tournament that caters for everyone, from absolute beginners to World Champions. From ‘Black Jack’ to ‘Time Warp’, every year guarantees a new theme and another unforgettable party. Hat Tournaments involve players signing up as individuals, and then on the first morning of the tournament teams are randomly formed by players being draw out “The Hat”. The 31st Melbourne Hat will be held on December 7th and 8th, 2019. The Melbourne Hat is held at Albert Park in the inner suburbs of Melbourne. Albert Park is easily accessible by car. The official street address is Pit Building 5, Aughtie Drive, Albert Park. Parking is NOT free. Parking tickets cost about $6.00 for the day on the weekend and must be displayed on the dash board of your car. Parking is only permitted in designated parking bays. Take Kings Way out of the CBD under the freeway overpass and turn Right at Albert Road. Turn Left off Albert Road onto Aughtie Drive and follow it past MSAC and the Albert Park Driving Range until you see the Pit Buildings on your Left. Follow Spencer Street out of Town and don’t get off it. Spencer Street will become Aughtie Drive. Come in on the Eastern Freeway, take Punt Road to the intersection with St Kilda Road. Take Fitzroy Street to the Right at this intersection and then turn Right into Lakeside Drive. Take the first Left onto Aughtie Drive and follow it until you find the Pit Buildings on your Right. Come up St Kilda Road to Fitzroy Street on the Left then turn Right into Lakeside Drive. Take the first Left onto Aughtie Drive and follow it until you find the Pit Buildings on your Right. Go through the tunnel and take the Kings way exit, turn Left onto Kings way. Turn Right at Albert Road. Turn Left off Albert Road onto Aughtie Drive and follow it past MSAC and the Albert Park Driving Range until you see the Pit Buildings on your Left. Come in on the West Gate Freeway and take the Kings Way exit, turn Left onto Kings way. Turn Right at Albert Road. Turn Left off Albert Road onto Aughtie Drive and follow it past MSAC and the Albert Park Driving Range until you see the Pit Buildings on your Left. There are 2 tram stops within easy walking distance of the fields, both of them are on tram number 96, the first is stop is Middle Park (stop 130) and the second is Fraser St (stop 131). From Stop 130 head into Albert Park and Travel Right until you see the pit buildings and other players (about 7min). From Stop 131 head into Albert Park and Travel Left until you see the pit buildings and other players (about 5 min). For more info visit the Yarra Trams website. Southern Cross Station is the best train station to get to then transfer onto the number 96 tram and follow the directions above. The easiest way to the fields from Melbourne Airport is to catch the Skybus to Southern Cross Station and then transfer to the number 96 tram (as above). Buses run every 20 minutes from the airport all times of the day. For more information and to get a ticket visit skybus.com.au. Qantas, Virgin Australia and Tiger fly to Melbourne from all over Australia. We recommend checking out webjet.com.au for the latest up to date flight information. *NOTE* No Lunch is provided on Sunday however teams will be provided with team snack packs and there will be food served during the final. Players may wish to complete a round of Disc Golf at the the local Fitzroy Gardens. An interactive course map is available here. A prize for best male and best female will be awarded for the best scores submitted to tournament staff the end of the day on Saturday. The venue and theme for this year’s Hat party will be announced later in the year. This Social event is strictly for people over the age of 18. Proof of age ID will be required for entry. Note – We do not have any official capacity or agreement with any of these venues. This list is presented as a guide only. For the latest news and updates on the Hat, please like the Melbourne Hat page on Facebook.